After a fast and furious beginning to Heavy Metal's 'Interceptor,' writer Donny Cates shifts gears a little and reveals the meat and potatoes of the story. It's a great way to lay out the stakes at hand for everyone. And everyone has something to lose. 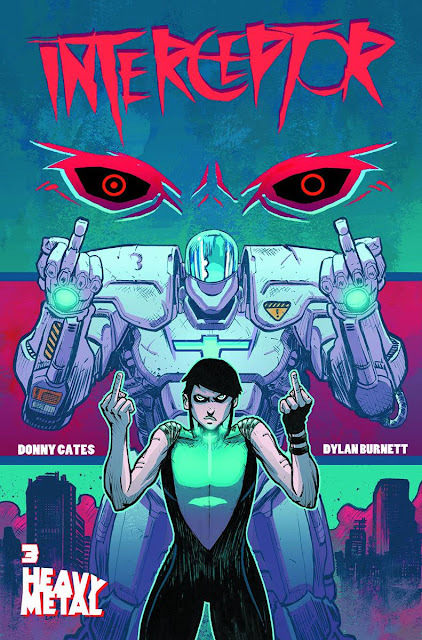 The pace of this brilliant new series from Cates and Dylan Burnett has been almost blistering without feeling rushed. It's also been the most entertaining of books with "evacuate-doomed-earth" dystopian tales that mashes up science fiction, horror, adventure-action, and even humor into a flawless mix. We learned that the rich folks on Palus can afford to retard aging which explains the kid-looking president. The president is extremely concerned that Poli, their super-soldier sent to the earth they left behind in ruins to do reconnaissance, has gone M.I.A. Poli is actually with Weep and her people. She and Weep's father Randolph get in substantive discussion what's moral in this new reality between his people, the vampires, and those who abandoned them. We get a lot of information that's revealed organically. There's no heavy-handed exposition but a serious exchange of thoughts between two important characters. If you thought Cates was all sizzle and no steak you are sadly mistaken. The appearance of Sheriff Arden Reeve and the mech suit he stole changes the narrative entirely. What he reveals ups the ante considerably for everyone. It's something you don't see coming and makes what happens next all that more significant. This wild, fun, adventure series just took a serious character-heavy turn and it was seamless. Dylan Burnett and Dee Cunniffe provide the perfect artwork for this turbulent, dark, and dangerous world. Burnett's designs are raw and layouts are kinetic and even during those deep conversations, he moves the "camera" in the scene to keep the eye moving. Cunniffee continues to use vibrant colors within darkened panels that pop. It's mostly colored from a darker palette but it's varied and adds plenty of depth. Heavy Metal has taken a deliberate approach to releasing comics and with such a wonderful book as 'Interceptor' you'll wonder why they don't make more. However, as we've learned from the Big Two, quantity isn't better than quality. You can't go wrong with 'Interceptor,' it's everything you love about comics.